Beyond the Sun, Moon and planets lie the stars of our Galaxy. Some are grouped together in clusters, others are spread out along the plane of the Galaxy along its spiral arms, a region rich in nebulae (vast clouds of gas and dust). Far beyond our Galaxy we encounter other galaxies, clusters of galaxies and quasars. These objects – galaxies, star clusters and nebulae – are what deep-sky observers study. (Historically, no distinction was made between what we today call nebulae, and galaxies – these “faint fuzzies” were lumped together as ‘nebulae’.) To find out more about these objects, visit the “Observing deep-sky objects” page. If you’d like to get involved in any of these projects, or initiate one of your own, please get hold of me. The Section’s newsletter, Nightfall, is available as a free download. Get your copy now! 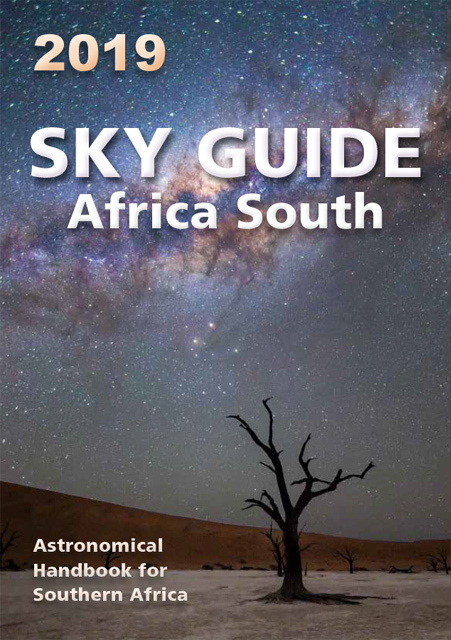 The “Big 5 of the African Sky” is an invitation to witness the most spectacular deep-sky treasures of the southern hemisphere: five objects that represent the best of the best! Observers who reach certain observing milestones are awarded virtual observing pins: a graphic that is created uniquely for you, officially hosted on the ASSA website, that you can link to and embed in online media to show off your achievement. A new version (1.5) of the ConCards was release on 2014 October 01. It now includes a rough all-sky map of the Milky Way to aid in identifying the most wonderful portions of our home galaxy. 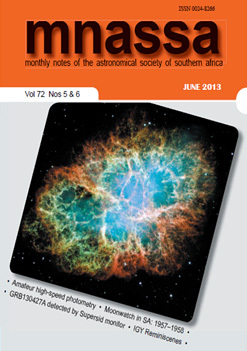 Download the latest edition as a 4.2-Meg PDF file. Reports to Council are published in mnassa as part of the Proceedings of the Annual General Meeting. The following at available online: Annual Report to Council (2017 July), Annual Report, 2014-2015 Annual Report, 2013-2014, Annual Report, 2012-2013, Annual Report, 2011-2012, Annual Report, 2009-2010, Annual Report, 2008-2009, Annual Report, 2007-2008, Annual Report, 2006-2007, Annual Report, 2005-2006, Annual Report, 2004-2005 & Annual Report, 2003-2004.